Most families are matched with their ideal puppy within 1-3 months. It is very difficult to predict an exact date or litter that you will be matched with. We cannot predict number of pups, genders or colors until a litter is born. Often families are registered for more than one breed or more than one size so the deposit list is constantly moving and changing as families at the top of the list are being fit into various litters. The greater your flexibility, the greater likelihood that you will be matched fairly quickly with a puppy. For example, if you're fine with a male/female, any color, and a Sheepadoodle or Newfiedoodle, you'll likely be matched faster than someone who needs to have a 15 pound, dark red, petite mini Goldendoodle, that has to be female. In general, the more specific your desire, the longer it will take for us to have that exact pup. How do You match puppies? When your name gets closer to the top of the deposit list, you and several other families will receive a puppy announcement via email. We ask families to view the pictures and descriptions and reply to us with their choices in order of preference. We match the puppies based on your preferences and the order in which the deposits were placed. You are always welcome to pass on a litter announcement if the timing isn’t best for you or you want to wait for something different. Unlike almost all other breeders, we don't "lock you into" a particular litter. We also offer a fully refundable deposit (minus a 5% processing fee). Can you explain your PARTNER/guardian home system? I have a few dogs in my home, but most of the Crockett Doodles program dogs are raised in Partner Homes and Guardian Homes. My Partner Homes are close family or friends for whom I have bought a high-quality dog. They keep that dog in their home as their beloved pets and have occasional litters for the Crockett Doodles program which I oversee. Their puppies are born, raised and socialized with their family. We arrange for each of the puppies to go to forever homes, and the Partner Home, who helped raise the pups, gets much of the profit from the litter. Many of our Partner Home families live in beautiful Greenville, SC. Over the past several years, we've expanded to have partner homes in multiple locations: South Carolina, North Carolina, Georgia, Tennessee, Virginia, Pennsylvania, Illinois, Indiana, Ohio, New York, Michigan, Arizona, and California. Our Crockett Doodles Partner Homes in multiple states offer convenient pick up options for adopting families. Click here to see pictures and read bios of several of our Partner Homes. Guardian Homes also help with the Crockett Doodles program. We buy a high quality female doodle dog for our Guardian Homes, and they welcome the dog as a beloved family member. We oversee a few litters from each Guardian Home dog, where we take care of finding the exact right stud dog, oversee the breeding process, and take the mother dog to our house, a Partner Home, or a Surrogate Home, when she is due. The puppies will be raised at our house, a Partner Home, or a Surrogate Home. We give a monetary gift back to the Guardian Home for allowing us to use their dog. The primary difference between a Partner Home and a Guardian Home is that the Partner Home has the Mom as their family pet and raises the puppies, for a Guardian Home, the puppies are raised at another family's home. A Surrogate Home is a home that loves raising puppies. We've worked closely with friends who love raising puppies. We pay these homes to partner with us in raising occasional litters from Guardian Homes. At Crockett Doodles, we value home raised puppies that have been well-socialized. Most of our Partner homes, Guardian homes, and Surrogate homes have children. While it is not a pre-requisite, the extra attention that a puppy receives being raised around children is a huge plus. Partner Home: Partner homes are family members or close friends of the Crocketts, who have a wonderful pet dog, and raise occasional litters. Crockett Doodles invests a significant amount of time, training, and finances (often buying special equipment, cameras, etc) into these partner homes. 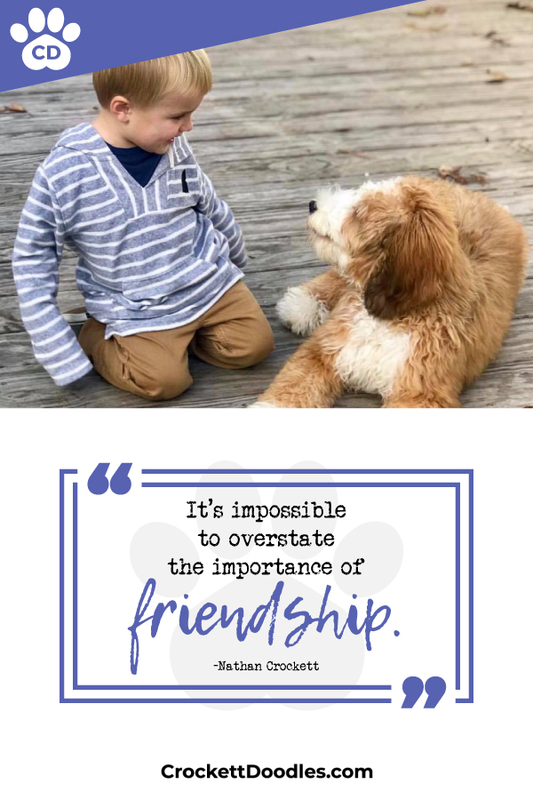 Our partner homes are trusted with the Crockett Doodles bank account information and collecting adoption fees from forever families. Partner homes work in close contact with guardian homes and surrogate homes to be sure that each adult dog in the Crockett Doodles guardian home program and each pup that is being raised in a surrogate home are being given the best possible care. Guardian Home: Friends who love adopting a wonderful dog for free and are willing to let her have a few litters under someone else's care. Surrogate Home: Our Crockett Doodles surrogate homes enjoy being paid to raise a litter of puppies in their home, under strict supervision from Crockett Doodles, and in close harmony with the veterinary team. After raising a litter of pups and mom at their home for 8 weeks, we will help the surrogate home wean the puppies from mom. The mother dog will be returned to her guardian home where she continues to be a beloved pet, and we will take the 8 week old pups to a Crockett Doodles partner home to transition into their new life as they meet their forever family. Surrogate homes do not have to be close family friends of the Crocketts, are not given access to bank account information, and are not burdened with communication with forever families. Surrogate homes are families who are willing to responsibly raise a few litters a year of pups at their house and are paid well for doing so. Many full-time breeders have dog facilities (barns/kennels/etc) that people want to view to ensure that the conditions are acceptable to them. We have no “facilities.” Our parent dogs live in my home, our Partner Homes, or our Guardian Homes (see description above). Pups are raised at the Crockett’s Home, the Partner Homes or Surrogate Homes. Years ago when Crockett Doodles first started, we could have people into our homes to meet our dogs (who are pets first of all). As Crockett Doodles has expanded through the years, we wish that we could accommodate the numerous daily requests for visits, but it is no longer possible. Dr. Nathan Crockett is a full-time administrator and teacher at Bob Jones University, travels nationally to speak and has five young children at home. Welcoming daily visitors to his private home on Paris Mountain has become impossible. It is a similar situation for our partner homes, who have other professional jobs as well. We realize that not everyone is comfortable with this arrangement, and we have no problem encouraging families to seek out other full-time breeders who can accommodate visits to their kennels. Many “traditional” breeders have dozens of leftover puppies that they can show to you, so they’re thrilled to have you visit and buy a pup. We’ve been blessed to have more people wanting our pups than available supply. We can say that we've almost never had a family come to get a puppy and walk away without the pup. We think we have one of the best reputations in the dog world (click here to read reviews). what can I expect on my pick-up date? Once you are matched to your new puppy, we will work with you to schedule a pick-up day and time around the time that your puppy is 8-12 weeks old. We assess each puppy individually and will let you know the best time for your puppy to make that transition to your home. We will take some pictures of you and your new puppy meeting for the first time. One of our trained staff members will walk you through our Puppy Quick Start Guide which includes helpful information about vet visits, choosing a groomer, our health guarantee, and tips on feeding and crate training. Your puppy's Vaccination Record will be given to you with all the vaccinations and de-worming medications and dates of administration your puppy has received thus far. We encourage you to give this record to your vet at your puppy's first appointment. You will be asked to sign our spay/neuter contract and will be given a receipt of purchase for your puppy. If you pick up in the state of SC, there will be a 6% sales tax. If you pick up in another state, or have your pup delivered to a state other than SC (70 cents/mile round-trip), you will not be charged sales tax. As stated in our application, all our puppies are sold as personal pets, not for breeding purposes. Our spay/neuter contract asks families to have their puppy spayed or neutered by their first birthday. We do not recommend spaying or neutering before 6 months of age as this can interfere with normal growth patterns. Whenever you choose to spay or neuter between the ages of 6 months and 1 year is completely up to you. If your veterinarian recommends waiting until after one year (particularly for large breeds such as Saint Berdoodles, Newfiedoodles, or Bernedoodles), we are fine with that. 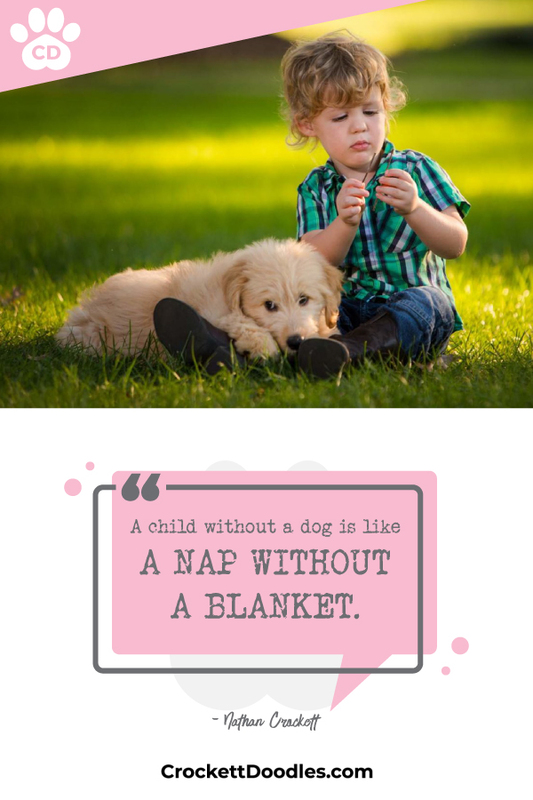 Your puppy should have the ability to sleep through the night. Sometimes they have a bit of an adjustment once they separate from their siblings but it doesn’t take long for them to adjust to their crate. (We've found that typically puppies can “hold it” half the number of hours of their age; so a 8 week old puppy can hold it 4 hours, a 10 week old puppy can hold it 5 hours, etc. At night you can usually add a couple hours to that formula.) During the day puppies seems to go through spurts where they have bursts of energy, and then they tucker out and sleep for a while. An eight week old puppy is still a baby and needs lots of sleep. How far in advance do I need to reserve a Christmas puppy? The average wait for one of our puppies is 1-3 months. Mid-to-late fall we begin getting lots of requests for Christmas puppies. While we are careful never to promise a pup by a certain date, we are always willing to include any deposit family in at least one announcement in the month of December. We also encourage families higher on our deposit list to consider waiting to be matched in January or February to allow a family with young children to have their Christmas surprise. Many families are happy to wait and other families prefer to postpone getting a December puppy to avoid the $200 Christmas fee that is applied to every December puppy (based on huge demand) or because they will be traveling for the holidays. We have found that we are able to accommodate many requests for Christmas puppies this way. Do you offer delivery options? While we do not ship puppies, we have had families fly in from all over the US (and even Canada and Mexico) to pick up their new puppy from us in Greenville, SC. Most airlines allow a passenger to carry their puppy on the plane with them in a soft carrier under their seat. We find that the puppies travel very well. We also have Guardian Homes who are willing to hand deliver puppies for a standard rate of 70 cents per mile round-trip in the continental US. Additional pups delivered to the same location will be $100 each for delivery. So if three family members (or neighbors) each got a doodle puppy delivered, you could save on delivery costs. Some families take advantage of this option and request their new puppy be delivered the entire way. Other families request to meet part-way. For families who fly in to adopt their puppy, we’ve had many who have found better airline options into Charlotte or Atlanta than Greenville-Spartanburg (GSP) and have requested their puppy be delivered to them at the Charlotte airport or Atlanta airport. Remember, too, that if the adoption takes place outside of SC, you won’t need to pay sales tax. What will I need for my puppy? Will I receive a list of Vaccinations that my puppy has received? On Adoption Day, you will receive your puppy's Vaccination Record that will have listed the two vaccinations your puppy has received as well as the dates of administration. Typically, our puppies receive Neopar and Nobivac Canine 1-DAPPv (Canine Distemper Virus, Adenovirus 2, Parainfluenza Virus, Parvovirus). Also noted on the Vaccination Record will be the de-worming medications your puppy has received to date. This Vaccination Record is designed for you to give to your vet at your puppy's first visit so that the next required vaccinations can be scheduled. Most vets recommend a 12-week and a 16-week vaccination as well as other vaccinations for your puppy's continued health. Do you do health/genetic testing (Including hip testing)? We are currently in the process of getting our parent dogs health tested. In general, we're working with Partner Homes and Guardian Homes to test for Degenerative Myelopathy (DM), Progressive Retinal Atrophy, Progressive Rod-Cone Degeneration (PRA-prcd), von Willebrand's Disease Type I (vWD 1), Hair/Coat Curl, and Hair/Coat Furnishings (IC). The coat testing is not as much about genetic problems as it is trying to breed for wavy/curly doodles more than straight coated doodles. For some of our doodle breeds, we are working to do the testing on specific issues that could be a problem for that particular breed. For instance in addition to the 6 genetic tests listed above, Labradoodles can be tested for Centronuclear Myopathy (CNM), Cystinuria, Exercise Induced Collapse (EIC), and Hereditary Nasal Parakeratosis (HNPK); these four issues are occasionally found in Labrador Retrievers. (Cystinuria is also a good test for Newfiedoodles and Newfoundlands can be prone to this issue). We pay for all of the genetic testing for dogs in Partner Homes and Guardian Homes and do not use a dog to breed that has any genetic issue we are aware of. We've let people know through the years, that once all of our breeding dogs have been fully tested we will likely increase our prices, as it is expensive/time-consuming to get all of the testing done. Some veterinarians that we have talked to are not fully aware of every type of test that should be done for a doodle. We strive to have doodles of excellent health, temperament, and looks to go to wonderful forever homes. For hip testing, we are in the process of testing all of our larger breeds (Newfiedoodles, Bernedoodles, Sheepadoodles, Saint Berdoodles, and Pyredoodles). We have had a few parent dogs that we have had to remove from our program because they did not have ideal hips. I respect the rare Doodle breeders who have all the testing done, even on their minis. I'm not aware of any breeder who does all of the DNA testing and hip-testing whose adoption prices are not considerably higher than ours. 1. Some of my guardian homes are uncomfortable sedating their smaller dog for the x-rays. 2. Hip Dysplasia is primarily a problem for large breed heavy framed dogs (70 pounds or more) or pitbull/bulldog type of dogs, Labs also can have issues. 4. Secondly, Poodles are one of the best breeds for not getting hip dysplasia (only 8.5% of those tested are dysplastic); 84 breeds rank ahead of them. Since I specialize in F1b pups, they are 75% Poodle, from separate genetic lines, and with the addition of hybrid vigor, I estimate that in our mini doodles, there would be about a 5-7% chance that one of our adult breeders may be dysplastic. My vet friend assures me that we would easily recognize it in our females, since we don't like to breed dogs until they are at least 2 years old. We did remove one female from our program before she was a year old, because she showed signs of dysplasia. 5. I think it is for these reasons that if you look at the OFA's website, you'll find that although some breeds have had more than 100,000 dogs tested, there have only been 288 Labradoodles tested since 1974, and fewer than 100 Goldendoodles. We are one of the rare doodle breeders who likes to test, but we don't require it for our minis. All of our puppies come with a one-year health guarantee, and if you decide to use TLC Pet Food (the puppy food we recommend) we extend the health guarantee to three years. With the thoroughness of our guarantee it is definitely one of "the best in the business." To read our full health guarantee, click here. Through the years, we consistently strive for 100% customer satisfaction. Every week, we receive glowing testimonies from those who got a doodle from us previously. Read a sampling of those here. We highly recommend TLC Puppy Food, and we think it is the best food on the market. We switched our dogs to it late last year, and we have seen a noticeable difference in their health. TLC is only available online and is not sold in stores, so you will probably want to place your order soon! (Click on this link to receive a discount on your first order: www.tlcpetfood.com/68765-1025) TLC is often made 3-5 days before it is shipped to your door for free, is only sold through top quality breeders, has an auto-ship feature so you’ll never run out, and is similar in price to brands such as Blue Wilderness. It is our favorite food by far, and I believe in its quality so strongly, that I extend our one-year health guarantee to three years for families who feed TLC. where will I pick up my puppy? Right now our main location is in Greenville, SC, so most likely you will be picking up your puppy there. We have several other partner locations, but those locations do not yet have as many Partner Homes, Guardian Homes, and Surrogate Homes, as we have in Greenville. Greenville, SC is where Crockett Doodles started and continues to be our central hub. Many of our partner homes are faculty, staff, or administration of Bob Jones University, or are closely connected to the Crockett family through local Greenville churches. Many families in nearby states do choose to use our delivery service (70 cents/mile round-trip) which also means they save on sales tax.